With Do You Like Rock Music?, British Sea Power moved further and further away from the visceral side of their sound and more towards the majestic, with hooks aiming for the stadium cheap seats and guitars ringing out towards the heavens. And like their score for the Man Of Aran documentary suggested, the band continues in this direction on Valhalla Dancehall, the band’s fourth proper album. This isn’t just a continuation of Do You Like Rock Music?‘s ocean-sized anthems though. British Sea Power instead decide here to embellish the more atmospheric elements of their sound, which fails almost as often as it succeeds. Surely, they have excelled at large, meandering productions in the past (hell, they made their debut’s 14-minute “Lately” never feel tiresome), and previous songs like “Waving Flags” were able to make their expansive sound genuinely rousing. But here, with the exception of the great, fist-pumping opener, “Who’s In Control” and the swaying closer “Heavy Water,” the more ethereal feel blunts the impact of the anthems, giving them less to rally behind and obscuring vocalists Yan and Hamilton’s hyper-literate words in reverb and synths. Similarly, a few songs like “We Are Sound” and especially the epic “Once More Now” are interesting in spurts but end up coming across a bit dull as they sputter to a close. Fortunately, not all his lost because Valhalla Dancehall‘s softer, more gorgeous moments redeem the album. “Luna” and the dreamy “Baby” are fine songs, but with its swooning strings and sighing vocals, “Cleaning Out The Rooms,” which first appeared on 2010’s Zeus EP, is the absolute standout. Also, the pure pop of lead single “Living Is So Easy” is one of the album’s best moments and, tellingly, one of the tightest and simplest. 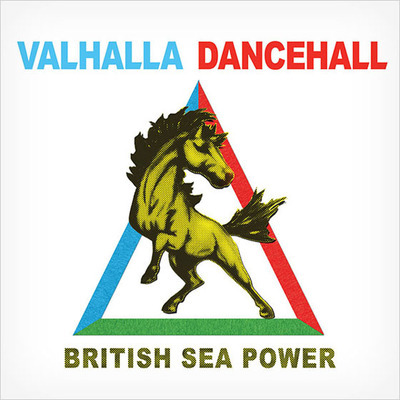 These moments are enough to save Valhalla Dancehall from mediocrity, but British Sea Power need to curb their ambitions if they don’t have the songs to back them up.